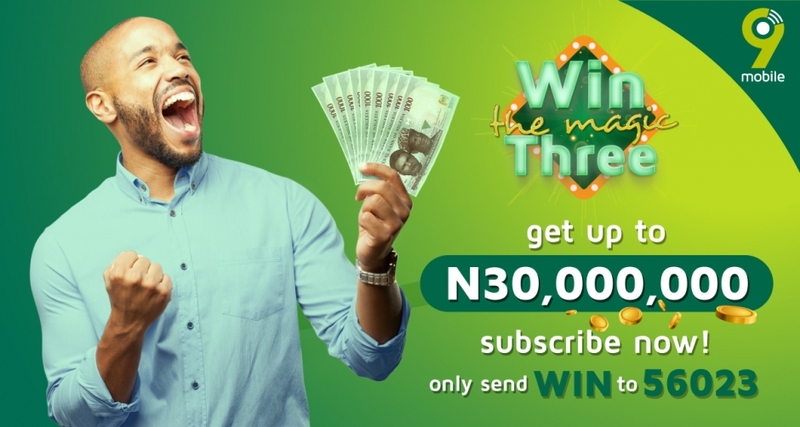 WIN N30 Million in 9Mobile Win The Magic Three. 1.The customer sends WIN to the short code 56023 (Price: N0 ). 2.The customer then receives the subscription confirmation via text message. 3.If the user has sufficient top up balance in his account he will then receives the daily coupon with 100 points towards the cash prizes. ➢Daily prizes. Every day ten winners will be selected via draw among the promotion participants to win a total of N300,000 in cash. ➢Weekly prizes: A cash prize of N3 MILLION in cash, will be awarded every week to the participant with the highest number of points by Sunday 23:59:59 as long as that player has sent at least 1 text message within the week. ➢Final Prize: 1 winner will be selected at the end of the promotion, among the active participants of the whole promotion period, via draw to win N30MILLION in cash. 4.To accumulate more points users can send GO to the short code 55023 and play the interactive trivia. The trivia game is important because it allows users to accumulate many more points. Remember that the user who has the most points each week wins N3 MILLION without a draw. (Price: N100). Is 9mobile promo still on? It says send "WIN" not GO.